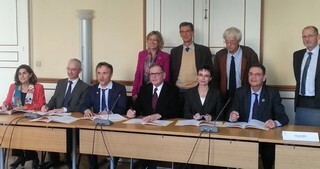 Laying a strong foundation for a joint plan of action between CGIAR and France to strengthen the ongoing partnership The French Ministry of Higher Education, Research and Innovation (MESRI, Paris), hosted the signature event of a joint declaration to reinforce scientific collaboration by several members of Agropolis International: Cirad, INRA, IRD, Irstea, Agreenium and CGIAR on the 22nd of March 2019 at the meeting of high-level officials of the International Commission for Agricultural Research (CRAI). Central to this declaration was the identification of joint actions that focus on three major scientific themes: agriculture and climate change, agroecology and nutrition and sustainable food system. For memory, the International Commission for Agricultural Research (CRAI) is : More on: http://www.agropolis.org/cooperation/crai-international-agricultural-research-commission.php Agropolis International participates and manages the secretariat of the CRAI. Photo caption: In the foreground: Mr. Guillou, President of Agreenium, P. Flammarion, Deputy Director for Research and Innovation of Irstea, Ph. Mauguin, CEO of INRA, Mr. Ferroni, President of the System Management Board CGIAR, E. Claverie of Saint-Martin, DG Research and Strategy of CIRAD, J.-P. Moatti, CEO of IRD. In the background: K. Bennett, Director Board and Council Relations of CGIAR, J.-L. Khalfaoui, President of Agropolis International, B. Hubert, President of CRAI, F. Lapeyrie, Executive Secretary of CRAI at MESRI.